..... Click the link for more information. . Aquarius is sometimes represented as a man pouring water from a jar. Although it contains no stars of first or second magnitude, it does contain a recurrent nova observed in 1907 and again in 1962. Aquarius reaches its highest point in the evening sky in October. (ă-kwair-ee-ŭs) (Water Bearer) An extensive zodiac constellation in the southern hemisphere near Pegasus, the brightest stars being of 3rd magnitude. It contains the planetary nebulae NGC 7293 (the Helix nebula) and NGC 7009 (the Saturn nebula), and the globular clusters M2 (NGC 7089) and M72 (NGC 6981). Abbrev. : Aqr; genitive form: Aquarii; approx. position: RA 22h, dec –10°; area: 980 sq deg. Aquarius and Capricornus from an 18th-century engraving by Montignot. Reproduced by permission of Fortean Picture Library. Like certain other zodiacal signs, Aquarius has been associated with more than one mythical figure. It is most often identified with Ganymede (“cup bearer of the gods”), a beautiful young man who, after being abducted by an eagle sent by Zeus, served as Zeus’s cupbearer. Ganymede was also Zeus’s lover, and was said to have been transformed into the constellation Aquarius. Cecrops is another mythical figure sometimes associated with Aquarius. Cecrops, half human and half serpent, was a culture hero who, as king of Attica, put an end to human sacrifice (by offering cakes instead of flesh to the gods) and founded a court. He also taught his people writing, the proper manner of burying the dead, and census taking. He is particularly remembered for deciding a contest between Athena and Poseidon in favor of Athena. In anger, Poseidon responded by flooding Attica. Despite the myth of Ganymede, there is no special connection between Aquarius and homosexuality (Neptune, ruler of Pisces, was the ancient patron of homosexuals). However, Aquarians tend to be eccentric individuals who enjoy working with other people. In line with the story of Cecrops, natives of this sign tend to be humanistic social reformers, with a special aptitude for intellectual pursuits like writing. 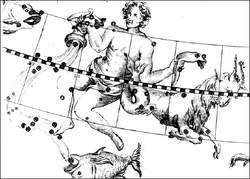 Also in line with the Cecrops myth, census taking reflects the mathematical and scientific inclinations of Aquarius. While Aquarians are known for being open-minded, they are also unusually argumentative. They tend to avoid emotions by intellectualizing them—symbolically choosing Athena (goddess of intellect) over Poseidon (ruler of water, the symbol of emotion) until they are overwhelmed (flooded). The sign that the Sun was in at birth is usually the single most important influence on a native’s personality. Thus, when people say they are a certain sign, they are almost always referring to their sun sign. There is a wealth of information available on the characteristics of the zodiacal signs—so much that one book would not be able to contain it all. Sun-sign astrology, which is the kind of astrology found in newspaper columns and popular magazines, has the advantage of simplicity. But this simplicity is purchased at the price of ignoring other astrological influences, such as one’s Moon sign, rising sign, etc. These other influences can substantially modify a person’s basic sun-sign traits. As a consequence, it is the rare individual who is completely typical of her or his sign. The reader should bear this caveat in mind when perusing the following series of sun-sign interpretations. You are fair, intelligent, objective, rational and often let your head rule rather than your heart. You seem rather self-sufficient and detached emotionally because you are capable of putting aside your personal feelings and viewing things dispassionately. But once you make up your mind on an issue, you are difficult to sway and can be rather dogmatic. You think in broad terms and are concerned with the world beyond your own personal sphere—your town, nation, or even planet. You are likely to become involved in community affairs, social organizations, and groups of all kinds, or to have a keen interest in such. You enjoy being part of a group endeavor and often find yourself organizing, managing, or supervising group activities. Forward-looking and progressive, you harbor great hopes for the future. You stay current and up to date, and respond to contemporary cultural trends, both in terms of personal style and in terms of ideas. When young you were very influenced by your peers and by group pressures and by all the “latest crazes.” You have an experimental mind and are attracted by the novel. Aquarius is the sign of geniuses—and criminals. It represents individuation, which is a five-dollar word meaning the process of being yourself. Set against your individuation are all the social forces of conformity. Buy a necktie! Shave your legs! Get hungry at noon! Outwardly, they show up as peer pressures. Inwardly, those forces are more subtle but even more formidable: all the internalized scripts that go with having once been a very little kid learning how to be human from mom, dad, and the television set. The Aquarian part of you is odd somehow. It doesn’t fit into the social environment, at least not without betraying itself. In this part of your life, the more centered you get, the weirder you’ll seem—to Ann Landers and her crowd. Go for it, and pay the price of alienation or ostracism. It’s high … but not as high as the price of living a life that’s not your own. With your Sun in Aquarius, the experiences that feed your solar vitality happen to be ones that most people will think are strange. There’s nothing spiritually dead about “normalcy”; it just happens that you’ve come to a point in the soul’s journey in which the path wanders through the cultural and social fringes. Don’t let that stop you! Be yourself, even if doing that annoys every figure of authority for miles around. Society will try to coerce you into living a life that’s more mainstream than what’s good for you. It will bribe, threaten, cajole, and intimidate you. As though that weren’t enough, it will send spies inside your fortress-walls: people who love you saying, “Please compromise on this! It tears me up to think what’ll happen to you if you don’t!” They’re sincere, but don’t let them sway you. Be yourself. You’re sailing in the thin, high atmosphere of true individuality. And one of the prices you pay is that, sadly, you’ll have to hurt some people to do it. (From “The Sky Within,” by Steven Forrest. Courtesy of Matrix Software (thenewage.com) and Steven Forrest (www.stevenforrest.com). The motivating force behind Aquarius is some form of the gregarious, or herd, instinct. He likes folks. He is sociable. In a higher manifestation, he is social. In a lower manifestation, he thinks that the world— the folks—owe him a living. Any way you look at the Aquarian, and whatever Aquarian you look at, you will find folks at the censor of his attitude. Either he depends on them or they depend on him. The sign can go either way. Whether he is a social reformer, or a hobo, people will be around him; he will be holding them up, or they will be holding him up. He thinks himself a great individualist, and he may be, but you’ll rarely find him alone. Rich or poor, great or small, deep or shallow, he is the life of the party. He may put his mind on the woes of humanity, solve their problems, give his life for theirs in a figurative or literal sense. Or he may fritter away his time in pool halls. But he will always be where there are people, in the flesh or in theory. A common interpretation of Aquarius would be something like this: Aquarius is associated with inventions, discoveries, innovations, eccentricity, progressiveness, science, humanitarianism, and organizations. Aquarius is ruled by Uranus and shares many traits with Uranus. Aquarius is friendly but not intensely emotional. Of all zodiac signs, Aquarius is the one that the commonly accepted characteristics have been least easy for me to understand. I have not found eccentricity or even progressiveness to be consistent traits of Aquarius! Very often when I share this observation with other astrologers (including those whom I greatly respect and whose work I admire), they look at me in disbelief, and cannot imagine how I can fail to see these traits of Aquarius. My view of Aquarius may be completely misguided, but I will share it any way as an example of one astrologer’s attempt to understand how Aquarius affects us. I see Aquarius as the sign of networking people and ideas. Aquarius relates ideas of different people to each other. Aquarians are social animals that typically prefer living in an urban area rather than a rural area because they prefer having access to the greater number of ideas and group activities. A person with strong Aquarian emphasis can find fulfillment in a rural setting too. Church clubs, school activities and community affairs are important in rural areas, but often Aquarius enjoys the greater number of options in an urban setting. With your Sun in Aquarius you are a woman whose spirit forges into the realm of the unusual. As an individual you are unique, and you may pride yourself on the things that make you different from everyone else. But you also have a strong desire to connect to those who are like minded, and may count your friends as your most significant blessings. Since your Sun speaks of “who you think you are,” you need to realize that your powerful mind, which can be strongly focused, is your link to your future, and that you are the creator of that future. The most friendly path toward developing and expressing your willpower and personal drive may be that of education. As an Aquarian Woman, you appreciate a well-developed mentality, and may feel most confident when you are comfortable in your knowledge about a subject or situation. However, you may have felt as a young girl that the people who knew the most were men, and you certainly may not have questioned whether or not a man had the right to be different. Although you may have felt the impulse to be different, you’ve never been entirely comfortable with the idea of alienating yourself from the society of which you are a part. And as you’ve developed your own individual identity, you may have sensed that becoming who you are might not exactly fit the model your father had in mind for you. If you’re owning your personal power, you’re confident about expressing your uniqueness and meeting the world on your own terms. If you’ve not yet embraced this part of yourself, you may by trying to accomplish it through projecting these qualities upon your husband or partner. Let him be the genius in the family! Your own genius may not fully emerge until you’ve consciously determined that you, too, deserve to be seen for who you really are. You are affable, courteous, unenvious, stubborn, merry and jocund, not given to quarrel, or a religious or spiritual nature, sober of speech, and strong. You can be ostentatious, but are free from maliciousness. You are an Air Sign, which means that you are “hot” and “wet.” The “wet” component means, among other things, that you blur distinctions, and that you are more swayed by passion than by intellectual argument. At your worst, you see too many connections, becoming lost in conspiracies. At your best, you spot the connection that everyone else missed. Being “hot,” you react to things quickly: by expressing your anger strongly and immediately, you don’t tend to harbor a grudge. This is the temperament type that is considered the most ideal, because you are the most comfortable within a social situation. You appear warm and friendly to others, and don’t seem too eager to hold them to an impossible standard. Lewi, Grant. Heaven Knows What. Garden City, NY: Doubleday, Doran & Co., 1935. Reprint, St. Paul, MN: Llewellyn, 1995. (the water bearer), a zodiacal constellation. The brightest star of the constellation has a visual stellar magnitude of 2.9. The best conditions for Aquarius’ visibility are in August and September. It is visible in the central and southern regions of the USSR. A constellation with a right ascension of 23 hours and declination of 15°S. Abbreviated Aqr. Also known as Water Bearer. The Aquarius crew is now working on upgrading the system, eventually allowing data transmission rates of up to 300 Mbps. The eight feature films owned by Aquarius will be on distribution around the world. Metalweb and Aquarius carry a range of products and focus on markets that complement each other. For more call 0903 658 1009 (75p/min + network access charge) Aries March 21-April 20 Today's potent Full Moon in Aquarius simply denotes that an alliance, an infatuation, close association, will play a more important role in your life. Data collected by Aquarius showed that 16 per cent of people accessing alcohol misuse services identified as Asian or Asian British, but that knowledge of the harms of alcohol misuse was not widely known in that group. Control Station's technologies have proven their ability to identify and correct performance issues that undermine a plant's safety, production, and efficiency," shared Ricardo Caruso, Aquarius Software's Manager of Special Projects. The Aquarius Platinum Group is a focused, independent, primary producer of the platinum group metals, which comprise platinum, palladium, rhodium, osmium, ruthenium and iridium. Each of the eight vessels will have two Wartsila Aquarius UV systems installed. CAPRICORN AQUARIUS PISCES For weekly stars call 09050 700 405 SAGITTARIUS CAPRICORN AQUARIUS CANCER LIBRA SCORPIO Libra Sept 23 - Oct 23 GEMINI CANCER PISCES VIRGO LIBRA SCORPIO SCORPIO The post-midnight hours will find you at a fun gathering which will bring a new romantic prospect into view. The NOAA was under orders to tighten up and the $3 million annual budget for Aquarius was eliminated, ABC News reported.